For those of you who know me and have followed my journey for awhile know my personal struggle with the genetic disease called Neurofibromatosis. To those new to my journey, it is apparent when looking at a photo of me that something is different. This post is about living with Neurofibromatosis type 1 (NF1), and what actually gives me life. NF1 is a genetic disease that, among other manifestations, causes tumors to grow on the body anywhere there are nerves. Half of all those with NF1 inherited it from a parent, the other half because of a spontaneous mutation of the NF gene. NF1 occurs in 1 in every 3,000 births around the world. There is no cure, although drugs are currently in development that may help slow and/or reduce certain tumor growths. Back in October I noticed a social media post from the Children’s Tumor Foundation (CTF), a non-profit organization aimed at raising funds for research of all NF-related disorders, raising awareness, and patient support. A big gala fundraiser was approaching, and they wanted selfies from the NF community to use during the event. I had just returned from a fantastic hike on Mt. Emei and emailed my selfie on the mountain, adding that I was in China with the Peace Corps. The PR-manager thought that was great and asked if I would write a personal story for their website. You can read the post here. In fact, when I sat down to write my story, I took inspiration from an original post on this blog, On Disfigurement and Grace. When I applied to the Peace Corps and accepted the invitation to serve, I knew the medical clearance process was going to be a challenge—as it is for many of us. But I knew I would have the additional challenge of seeing specialists to document the disease and support me that I was healthy enough to serve with these tumors. I’m grateful for supportive specialists and the medical insurance that allowed me access to them. It is true that every day when I look in the mirror, it’s a challenge to go outside. But as you can read on this blog and elsewhere, I choose to live and do that which gives me life. I’m proud to be serving in the Peace Corps and happy to have traveled all over the world. This is my 100th post on this blog, and to celebrate I thought I’d write a brief manifesto of sorts–a window into who I am and why I do what I do. As I wrote earlier in my story about staying in the Abbey of St. Hildegard of Bingen, I am aligned to be out in the world, in relationship and direct service with people. Translating that into religious language, my calling is to Love God and Love Neighbor. Out of God’s great love, grace, and redemption, I find a love that cannot be kept inside. I am compelled to love my neighbor. I am compelled to love and serve people throughout this country and world. This means I will seek work that is fulfilling and servant-oriented. So far, for me this has been manifest in pastoral care, spiritual direction, direct service with the poor and homeless, dismantling racism, intentional community, and global service. The work need not be overtly religious, because I know that loving one’s neighbor transcends religion and theology. One need not be religious to know the longing to love and be loved. One need not be religious to serve and have relationship to our neighbors. What I write here comes from moments of grace I believe are worth sharing, the stories of life and relationship. Grace is in the brief time I spent with Suon in Siem Reap, Cambodia. Grace is in the relationship to my Indonesian brother. Grace is in participating in weddings and funerals, hearing people’s hope for their country, and meeting a fellow pilgrim. And so much more. This means that in my work and in my travel, I am motivated out of grace and love, and a desire to enjoy this amazing earth. It is my privilege to be able to share some those experiences on this blog. Love does not stay idle. 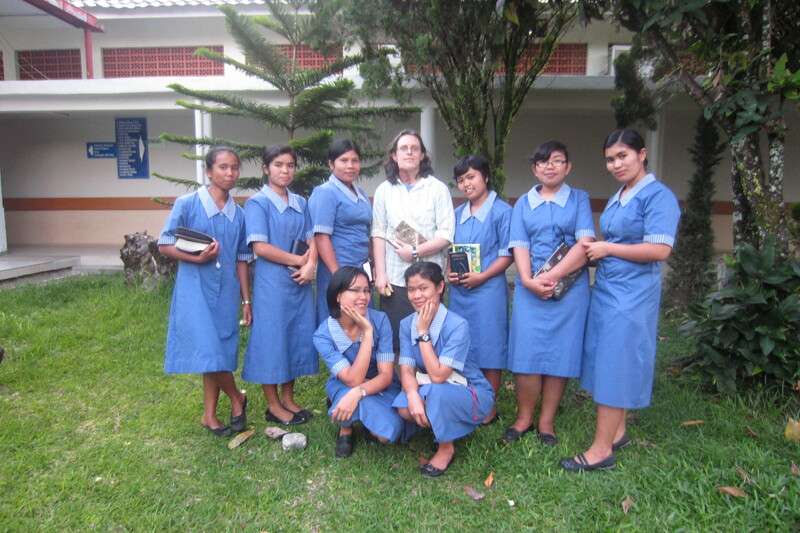 Visiting the hospital in Balige, North Sumatra, Indonesia with the students. April 2012. 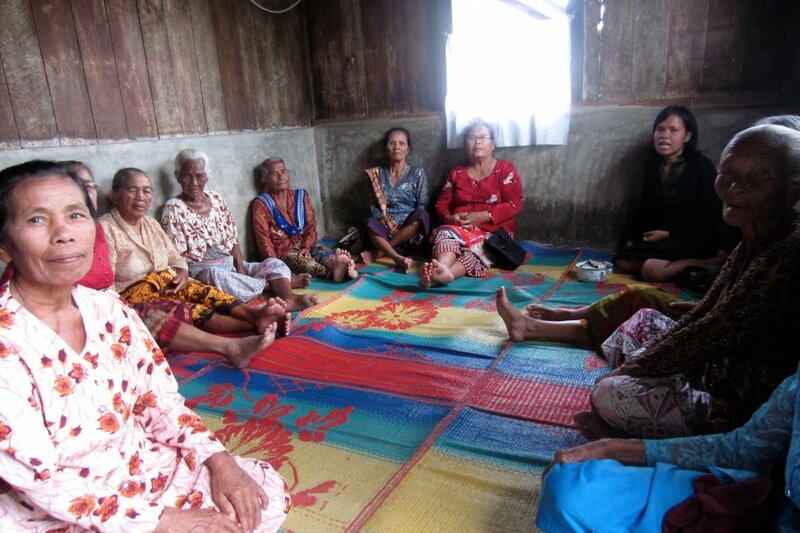 Sunday devotion with elderly group, village of Marihat Tiga, North Sumatra, Indonesia. May 2012. Meeting Krishna (far right) and his companions. Kumily, Kerala, India. January 2009. I’m going to start collecting stories and photos from places I’ve been in a series. Each post in the series will feature photos and stories from a different part of the world that I’ve been following the alphabet as names of places, cities, or countries. This isn’t tips or practical information, rather it’s just me telling about the journey. Today, we start with A, and I chose to feature Alaska. It’s a fair question often asked by runners before and during the arduous task of training for and completing the 26.2 mile (42.2 km) test of physical endurance and mental stamina called a marathon. The answer to why varies depending upon the runner, but one can assume many marathoners have questioned their motives and abilities along the way. This is Suon. He is a victim of the war and devastation caused by Pol Pot’s Khmer Rouge in Cambodia from 1975 to 1979. 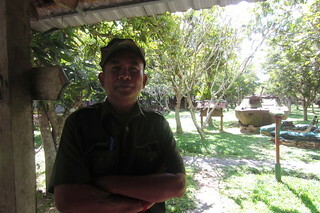 I met Suon while taking the tour at the War Museum in Siem Reap. The museum itself is little more than rusting old tanks, and an assortment of guns, landmines, and photographs. What makes the experience real are the personal stories of tour guides. Not only did I learn about Cambodian politics past and present, but more importantly I heard a man’s story of suffering and survival. Suon’s family was killed by the Khmer Rouge and he was taken and made to be a soldier as a boy. His life as a soldier ended when he stepped on a landmine that blew off his right leg. The recovery was long and difficult without any family. Now he makes a living as a guide at the War Museum. He expressed dismay at the current situation in Cambodia, but hope that change for the good can come. I am amazed that such hope can prevail over cynicism or despair–but it is hope that is necessary to make a better future. He asked if I had come to Siem Reap because of the half marathon race. Yes, I said. The day before I, along with about 7,000 other participants, had finished the Angkor Wat International Half Marathon. He thanked me because the race was organized to help charities in Cambodia, especially for those who suffer because of land mines. The work to remove all remaining land mines and to care for the victims is ongoing and must continue. A week earlier I had a brief encounter of hope on the way into Cambodia. The woman who sat next to me on the flight into Phnom Penh was visiting her country for the first time since her childhood. After leaving Cambodia, she became a US citizen and hadn’t returned since. She expressed a mixture of excitement and nervousness to see the country of her birth. Her life was very different than the tour guide’s, but they are all part of Cambodia. I don’t know what happened after we landed, but I hope the time was good for her, and that she found what she needed in visiting her country and with relatives. I continue to think about Cambodia. I am thankful for the stories I heard and share in their hope for the future. For some of my posts now, I want to profile a few of the people I’ve met along my journeys. I traveled in India from the end of December 2008 to mid-January 2009. It was an amazing experience that cannot simply be wrapped up in few words. Here is one story I wrote about an unexpected encounter as I traveled in the southern state of Kerala. Kumily appeared to be a busy junction in the middle of Kerala’s spice and tea region. The market was overflowing with tea and spices and the streets full of travelers from far and wide. I had purchased my spices from a shop and stepped outside to wait for my friend. I observed the scene–typical of Indian life there were people, cars, motorbikes, bicycles, and animals occupying the same road. Inspired, I pulled out my camera for a photo of the busy street life. Then a man robed in orange cloth approached me. “How are you liking India?” he said joyfully. He was thin and his robes bore signs of wear and long use. As I looked into his bearded face, I wondered if he was about my age. June was a busy month, and July promises to be another busy month. Although most of the students have left the deaconess school for their practical work, there is still plenty of work to do. Presently, I am working on a schedule and syllabus for an intensive English course for the incoming students due to begin in August, as well as the teaching I’ll do throughout the semester. And then there is my responsibility at the HKBP Nommensen University in Pematangsiantar. The final week of June I had another busy week of teaching and observing (and being a radio star on an English radio program). For the students there, that was the last week of the Semester. I will return to Siantar on Friday in advance of a rather large seminar on the 7th of July. Somehow, this small deaconess found herself as a speaker in a plenary session of a seminar titled, “English Language Acquisition Paradigm and Integrated Character-Based Learning”. The topic assigned to me is “Models of Teaching.” A post will follow about the event. I have not forgotten about other stories to share. My time has been short and only recently have I fixed my laptop (well, not fixed. It needed a completely new hard drive, but a clever university student helped me). So, I expect it to be easier to post my reflections. The reason it is titled “A common calling” is that as a deaconess, I have been called here to be a servant. There are many things that are different about life in the U.S. and life in Indonesia. What is the same, what transcends the language barrier and other differences, is our desire and common calling to love God and love neighbor. Enjoy! A typical scene in a restaurant here. 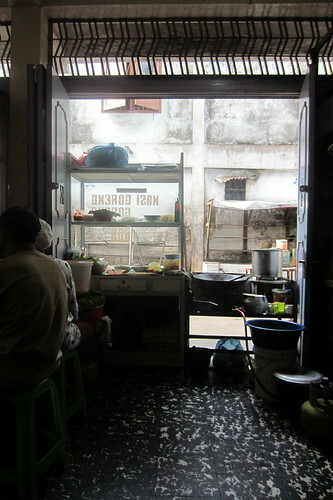 This one is in Siantar, where I ate some delicious mie goreng (fried noodles). I stepped off the light rail into the damp afternoon air. I craned my neck, looking for a friend, when a man who had been in the same train car from downtown Portland approached me. We hadn’t spoken on the ride. In fact, I had been listening to my “Lent” playlist on my iPod, lost in my own world of thought. He first remarked about the drizzle that fell lightly on us. What happened to the sun? Of course it rains when we’re off the train. I smiled. In fact, I was glad he noticed; I hadn’t that day. We bid each other bye, and walked our separate ways. This wasn’t the first time for such an encounter. However, it was a fleeting moment of grace, which I savored and filed in the back of my mind. Two days later another knotty tumor appeared on the right side of my face; one more to add to the collection, an even more disfigured face to get used to. Now awaiting the word on what series of flights have been booked to Indonesia, I share this piece of me with you, dear readers, as it is a part of me wherever on this earth I go, whatever that calling may be—and it is very visible. I have a genetic disease called Neurofibromatosis (NF). A more detailed explanation of NF can be found at the Children’s Tumor Foundation. Brief facts: NF type 1 affects 1 in every 3,000 births; NF2, 1 in every 25,000. Although it is genetic, and parents with NF (types 1 and 2) have a 50% chance of passing it on to each child, half of all cases are a result of a spontaneous mutation. NF1 can cause birthmarks, tumors, freckling, and learning disabilities among other manifestations. There is no cure, no drug yet to slow or prevent tumor growth. Neither is there any prediction of severity or when or where a tumor might grow; they can grow anywhere there are nerves. I have NF1 with dozens of tumors all over my body, all of which are benign, and most of which are small and underneath the skin. The largest and most visible is the grouping of tumors on the right side of my face. I come from a culture where inner beauty is a nice idea, but that’s not necessarily the signals most often sent to me: I should have more stuff, acquire more wealth, and be thin and beautifully blemish-free; money can buy you all this happiness. Me, well, I’m full of outer blemishes, so I’ve learned to cling to grace daily. I have difficulty accepting a theology that says God made me right down to my DNA. Who, then, slipped in that faulty gene? Who turns the switch to allow a new tumor? I’ll spend my lifetime supporting research to eradicate this disease—then probably some other gene will mutate to form a new disorder for the world. There he is, standing in front of a crowd, and everyone can see that just about the worst thing that could happen to a person physically has happened to him. Yet he’s enjoying himself immensely, talking about ten seconds of grace he felt here, ten seconds he felt there, how those moments filled him and how he makes them last a little longer. Everyone watching gets happy because he’s giving instruction on how this could happen for them, too, this militant self-acceptance. No, I wasn’t given this disease as a test, but I can live to the fullest and notice those raw moments of grace, just like David. I wish I didn’t have the tumors, or that I didn’t have to face a lifetime of wonder when and where the next one will appear. But I will, and I am compelled to share those grace-filled meetings, my love of life and God, and the courage in spite of disfigurement. I share this as who I bring as a missionary. I may not write of this again, as I will soon be sharing other stories. 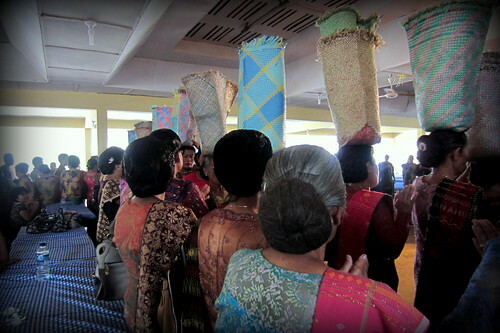 As I have most of my life, I will be noticing (and writing) moments of grace while I’m teaching English in Indonesia. But most importantly, I mean to share this today: out of brokenness, beauty and wholeness; out of death, life. Is that not part of our faith as Christians? You, too, have brokenness in need of healing. And now you know what it is on my face when you see photos of me. My season of waiting continues. Even though I am still in the US waiting for a visa to Indonesia, I can share important stories. Today I will share a video I first encountered a few years ago, which is from a TED conference in 2009 (click to learn more about TED). I encourage you to do more than watch the video below. Take note of the stories around you. What narratives of the diverse continent of Africa (Or any other country or region of this world) are you reading? Who is telling the story? Whose voices are being heard? Whose voices are missing? Ask how can we move from pity toward justice, empowerment, and accompaniment.